Looks like Microsoft have made some very nice and very much welcomed enhancements to the Windows ‘Task Scheduler’ The first this i notice when opening up (apart from the new 3 pane view) is there is a Microsoft –> Windows folder, under this there is a whole host of sub folders which contains pre-configured tasks, some of which are ‘Active Directory’ my favorite time saver ‘defrag’ there is also an interesting ‘Virtulization’ one there, whilst there is only one preconfigured under this one which is a ‘Guest Startup Task’. I am hoping that there will be more items to follow closer to the official release of the vitalization, some such as Create a snapshot, restore snapshot. None the less this is a big help that some of these pre-configured scripts now exist. The other items I have noticed on a quick setup of my own task, is there is first of all 2 options for creating a task, one being ‘Basic’ and the other is simply ‘Create New Task’ the basic is like almost everything now, you guessed it, a wizard. The ‘Create New Task’ is not, it shows you the tabs which are each step to configure the task schedule. Whilst I am sure i could find many uses for the ‘display a message, I am more so happy about the email functionality, no longer do I have to write a batch file that calls a VBS email script when executing a job, or something of that nature, I can now go and setup my start program, following that i can then go and setup up my Email task. So this will start the app i have chosen, and then on completion will email me the attachment i have specified or an text email, notifying me. Well done Microsoft, this for me is another huge +. 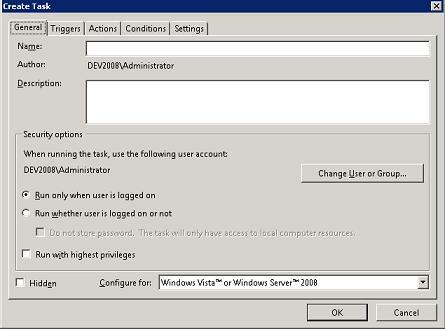 As promised a better look at the firewalls built in to Server 2008. 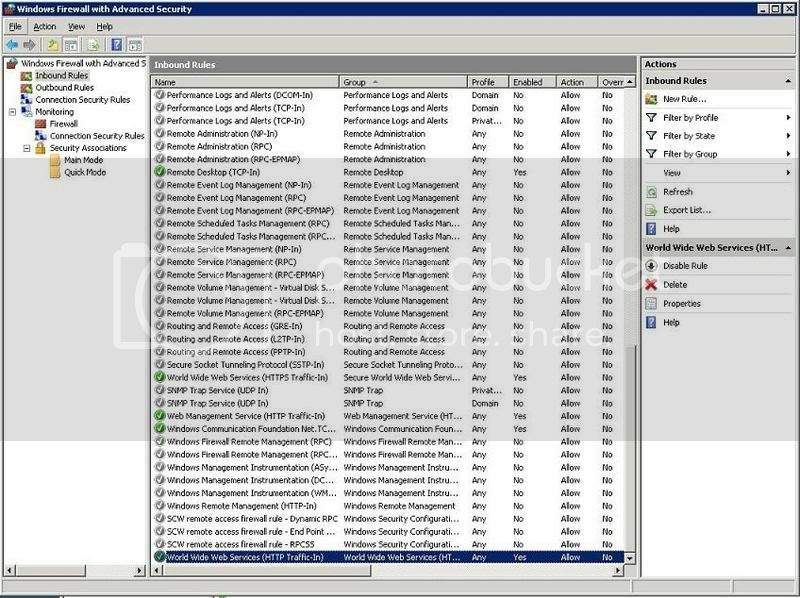 Below shows you the default screen when first entering into the ‘Windows Firewall with Advanced Security’ As you can see by default everything is turned ON, as it should be with any kind of firewall. Now previously i said this firewall is kind of like a very light weight ISA server, Well if you have played with ISA you will see why. Go to Inbound Rules’ its located on the top of the first pane. And take a look at the huge amount of rules already preset and configured. What impresses me is the amount of control we now have from the firewall, with the last firewall, or the standard type firewall offered in XP sp2 2003 server etc, lets face it, it wasn’t very useful. This on the other hand could be of use!! If you right click on an existing rule you are able to edit it, You can apply the Rules directly to the Services or applications that you want to permit, yes you could do this through the old firewall, but again that was not the best of interfaces, and just found to be clunky. Then of course you have the ‘Users and Computers’ Tab here it lets you drill down further and allow only a particular audience, which is very nice and makes it very quick if your in an AD environment. 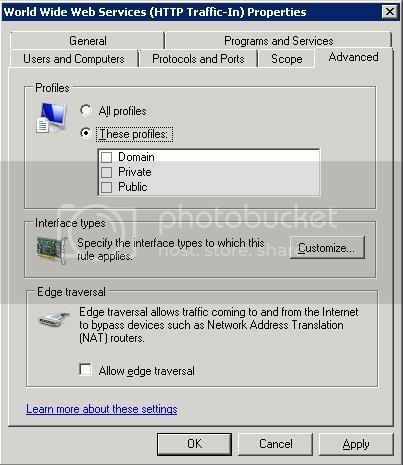 You have a ‘Protocols and Ports’ tab, not much to say here, this is obviously a given. Scope again is really a given but again the previous firewall just didn’t cut it, this is looking much more promising. There is Loads more Like monitoring, connection Security, These I will revisit at a later date. All in all, I think this is a much better firewall there is certainly alot more offerings in this, more flexibility, and something that could be seen as a entry level firewall. Although it might suit the needs for a small business, most people including myself will be sticking to our enterprise hardware firewalls. Yes that’s right firewalls, not just one that we are all use to in 2003 Server, XP. So if your trying to server up pages from your IIS7 and you are getting 403 error’s, and you have disabled the firewall in start –> control panel –> windows firewall. Well guess what your not out of the woods as I first thought. There is another firewall Administration Menu / MMC, where you ask? Its in the Administrative tools hiding. Its called ‘Windows Firewall With Advanced Security’. by turning these off your pages will now server up, provided everything else is configured correctly. Keep posted I am bloging more about the firewall and its functions shortly, as its actually seems like a ultra mini light weight ISA.